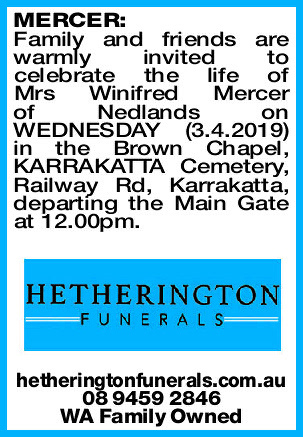 Family and friends are warmly invited to celebrate the life of Mrs Winifred Mercer of Nedlands on WEDNESDAY (3.4.2019) in the Brown Chapel, KARRAKATTA Cemetery, Railway Rd, Karrakatta, departing the Main Gate at 12.00pm. 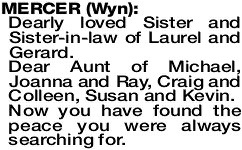 Dearly loved Sister and Sister-in-law of Laurel and Gerard. 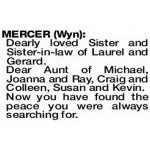 Dear Aunt of Michael, Joanna and Ray, Craig and Colleen, Susan and Kevin. Now you have found the peace you were always searching for. 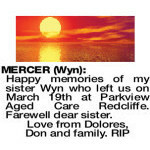 Happy memories of my sister Wyn who left us on March 19th at Parkview Aged Care Redcliffe. 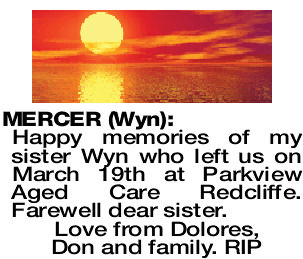 Farewell dear sister. 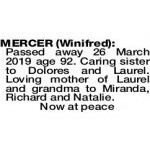 MERCER WINIFRED Passed away 26 March 2019 age 92. Caring sister to Dolores and Laurel. Loving mother of Laurel and grandma to Miranda, Richard and Natalie.